In order to view the status of an invoice you have sent to a client, you need to access its timeline. This is really simple. Tap on the invoice in the list (regardless of whether it’s in the ‘Done’ or ‘To Do’ list). 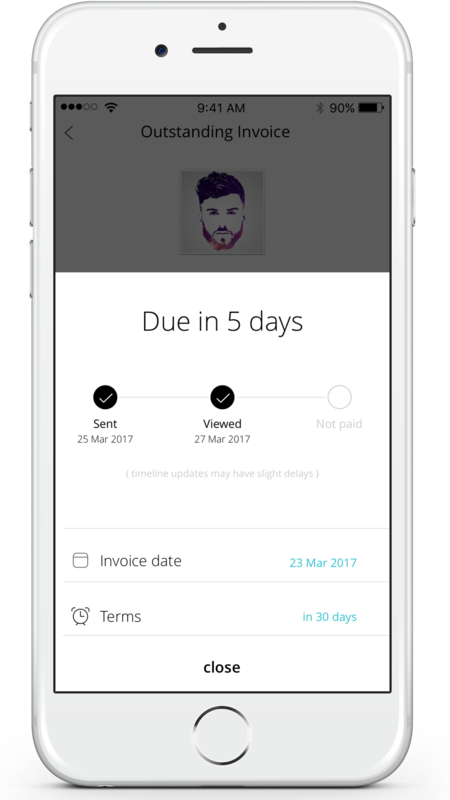 Once the invoice has come up, tap on the date - located at the bottom-centre, between the invoice reference number (left) and the ‘More’ button (right). By tapping on the date, this will reveal the invoice’s timeline which displays the invoice’s status, ie. whether its been ‘sent’, ‘viewed’ or ‘paid’. Please note: timeline updates may not always be in exact realtime, and may have a few hours difference or delay.